What are D.C.'s chances in the bid for the 2024 Olympics? What's the deal with that event Fairfax is hosting next year? Oh, and who's going to win the final World Cup match? Answers (kind of) to three of sports' big questions are in, courtesy of Bill Knight, a veteran in the sports-event managing industry. 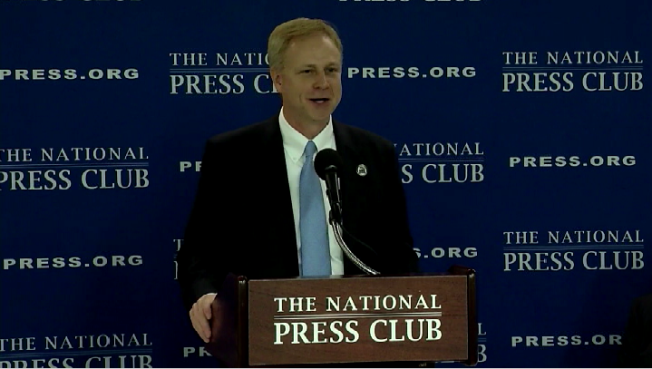 Knight discussed a few ongoing topics in the D.C. sports community at a news conference Friday. The first question was how D.C. stands in the bid for the Olympics -- the district is one of four U.S. candidates in the running. "Any Olympic bid is a long shot," he said. "I think D.C. has as good of a shot as anybody." Knight says the city has "an amazing canvas" for new Olympic infrastructure. "It would mean a tremendous amount for the economy and sort of changing the face of D.C. a little bit," he said. Plus, he didn't seem too worried about the potential traffic nightmares. Knight also talked about his current project -- getting Fairfax, Virginia, ready for the World Police and Fire Games, now known as Fairfax 2015, which is the world's largest multi-sport event. With more than 12,000 athletes competing and 60 Olympic-style and public safety-specific sports, Fairfax 2015 will serve as a good model for how D.C. would fare as an Olympics host. "You have to demonstrate you can really get ahead of the game with your planning," he said, adding that the event is expected to garner $80 million directly or indirectly for the region. "This is a great opportunity that we can pull together to host an enormous event," said Knight. As a former vice president for Venues of the World Cup, Knight also offered his own insight into the Germany-Argentina match this weekend. "With the semifinal games, a lot of people are picking Germany, and I'm going to have to go that way myself," he said. His final prediction? Germany winning 2-1. You can see the results to that game for yourself Sunday at 3 p.m. To check in on Knight's other predictions -- only time will tell.